Leading Manufacturer of ldpe extrusion machine, plastic extrusion machines, blown film extrusion machine, plastic pipe extrusion line, hdpe blown film extrusion machine and extruding system from Ahmedabad. We are a trustworthy organisation in offering a wide gamut ofLDPE Extrusion Machine. We are a trustworthy organisation in offering a wide gamut ofPlastic Extrusion Machines. 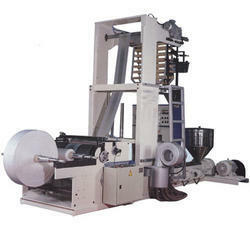 We are a trustworthy organisation in offering a wide gamut of Blown Film Extrusion Machine. 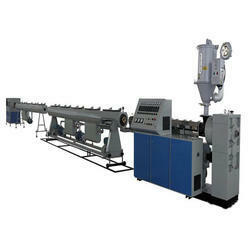 We are a trustworthy organisation in offering a wide gamut of Plastic Pipe Extrusion Line. 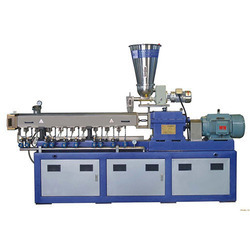 Mono Means Single , So here For HDPE Blown Film Extrusion Machineits Single Extruder and the size of the screw is depending upon Size that has to be Manufactured .This Machines are made in to Process HDPE or Commonly term used is HM and LDPE . From Extruder when Granules are Melted at Required Temperature it goes to Die Where in a Bubble is Form to Round Sheet so Die is Round in Structure , After Forming the Bubble it Goes towards upward and from there it goes to Nip Roller and then it Comes Downward to the Winder . Also there is a Huge Percentage of Re-Process Granules is used and in some cases 100 % reprocess granules is used so we ensure the Screw Barrel is Designed in Such way that it could process Re-Process Granules . We are offering a wide range of Extruding Systemthat is known for their precision designs, efficiency and long service life. 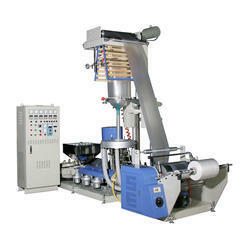 we have developed ourselves as the most promising organization of a qualitative range of Two Layer Extruder Plant.